Ukraine is nestled between the Carpathian Mountains to the west, Black Sea and Crimean mountains to the south. The heartland	or steppes	are mostly fertile black soil ideal for	farming	such crops as wheat. Ukraine has been known as the â€œBread Basket of Europeâ€�. Ukraine is well known for its great diversity, amazing flavours, and hospitality thus we proudly raise the Ukrainian flag displaying blue over yellow, symbolizing blue skies over golden fields of wheat. Borstch, Cabbage Rolls and Varenyky(pyrogies) are some of our best known food items and are available daily from our kitchen Our traditional	dances are expressions of Ukrainian life and happiness, with the openingwelcome	dance or â€œPryvitâ€� symbolizing prosperity, hospitality and kindness. Our cultural	display	allows you a glimpse of	Ukraine	through displays of our	national dress, our pysanky(colourful hand painted Easter eggs), history, and samples of some of Ukraineâ€™s	artistry in various forms. 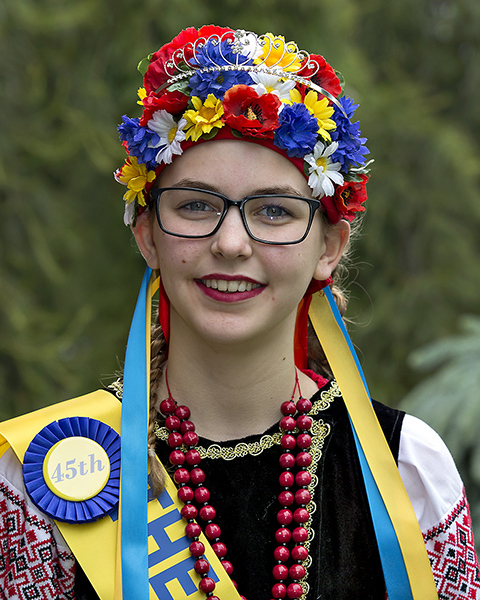 Ukrainians are a generous and hospitable people with	food and dance at itâ€™s centre. So, be sure to visit our beautiful cultural display, enjoy some delicious food and drink while being entertained by our energetic dancers. Ethnic Food, Ukrainian Dancers. Enjoy a taste of our countryâ€™s food. Visit our Cultural Display with Souvenirs you can take with you. We appologize that we are not wheelchair accessible.